There are several new restaurants in the Frederick County area, so as I’ve said in prior posts, it really is tough to decide on which establishment to spend your time and money. 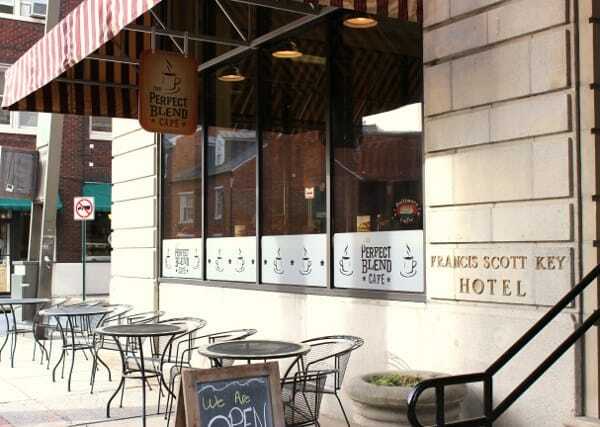 Pam, my other half, has been asked to write a restaurant review in Find It Frederick magazine about a new café in downtown Frederick, called The Perfect Blend Café. 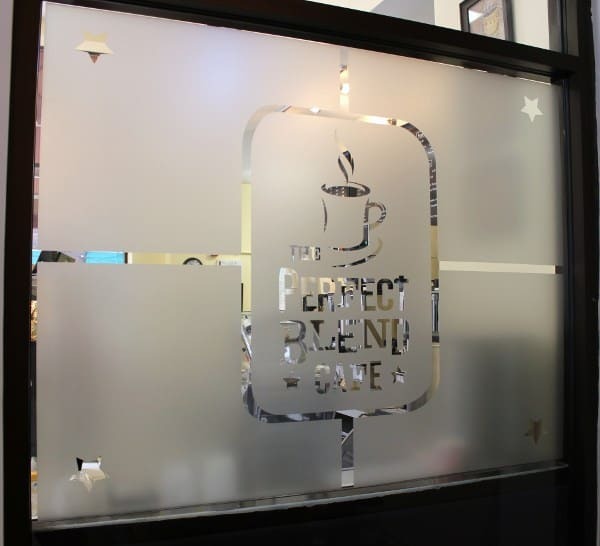 So, Pam and I visited The Perfect Blend one weekday afternoon to check it out! 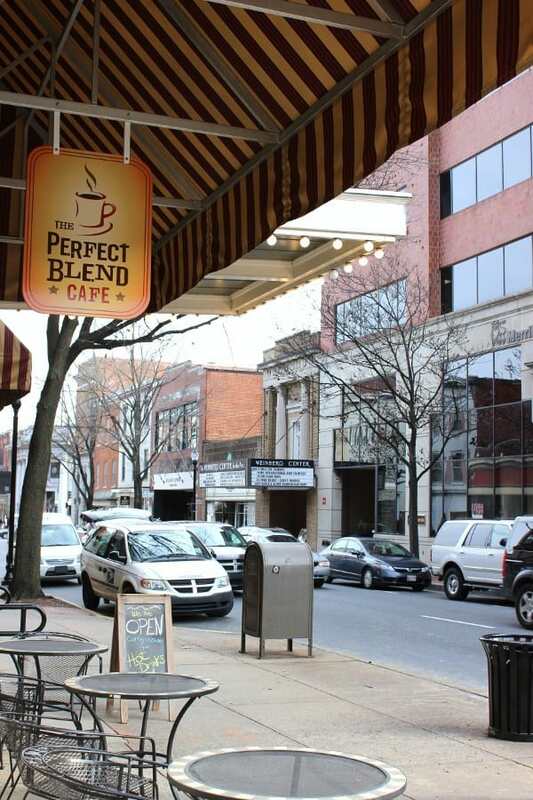 The Perfect Blend is located on the corner of West Patrick Street and North Court Street, in historic downtown Frederick, MD. Ya definitely don’t have to twist our arms to get us down to this area of Frederick – we just love it! 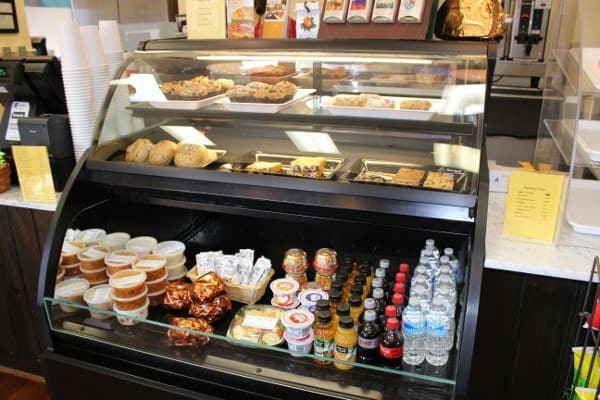 You can park along the street or choose to park in one of the 2 parking garages very conveniently located within walking distance of The Perfect Blend (see The City of Frederick’s info on parking in downtown Frederick). 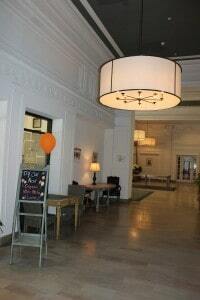 Francis Scott Key Hotel originated in 1922. It was sold in the seventies and converted to a retirement center until the year 2000. In 2002, this historic building became the home of Francis Scott Key Apartments, attracting mostly urban professionals. 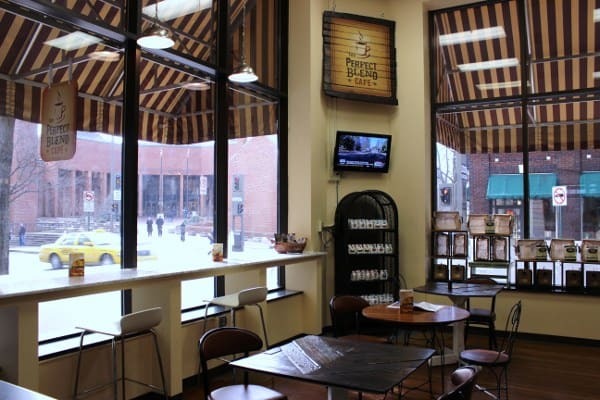 In 2013, The Perfect Blend Café became a welcome addition to this building. This, I found, is such a cool feature of this café because you will see “regulars” coming in to get a coffee or a sandwich and chat with Rachel, the owner. It really contributes to the small-town vibe of this place. But, at the same time, it reminds me of a streetside market you would stumble upon in New York City, as you will get what you need/want here, along your travels throughout your day. Here is their menu. All of the fresh food items are brought in by local businesses. 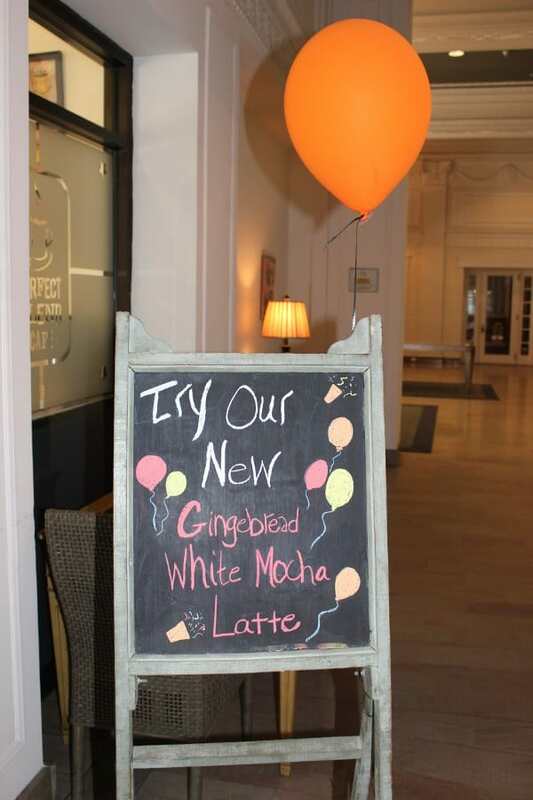 We totally loved the idea of The Perfect Blend Café supporting other local businesses in this way. 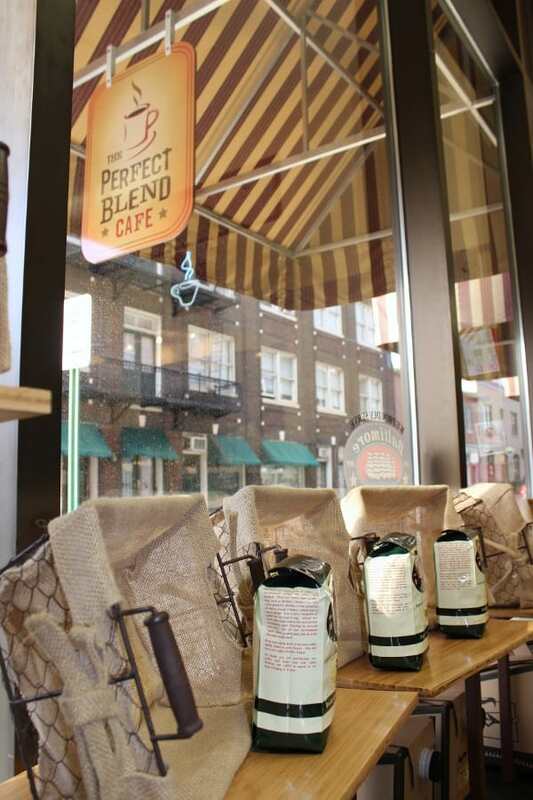 Baltimore Coffee and Tea Company, Honey Baked Ham, and other local businesses have teamed up with The Perfect Blend’s offerings. Since Pam and I visited on an afternoon, their selection of pastries/donuts for the day were pretty picked over (which was a good thing since we are both striving to eat healthy!). BUT, there was plenty there that we could choose from for lunch, that fit right into our healthy eating plan!! 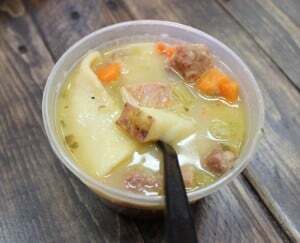 I got a home-made chicken pot pie soup (displayed along with sandwiches and salads – Rachel heated it up for me) and a package of pretzel thins with hummus. 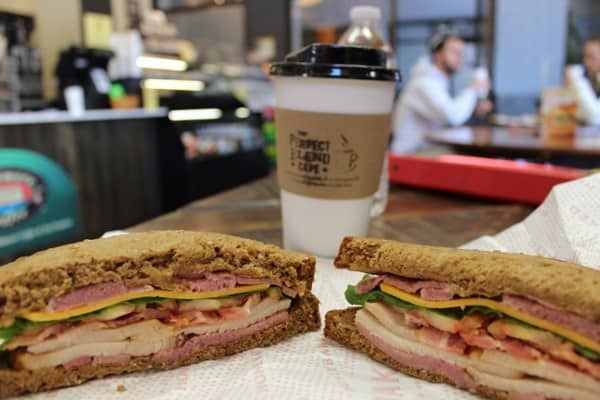 Pam got a turkey and ham club sandwich and a Snicker’s Latte (which Rachel very thoughtfully offered to make with skim milk since she heard us talking about making healthy choices). I tasted her coffee and it was very tasty (I didn’t order my own coffee because I had already had my quota for the day :))! Everything was delicious, hearty and good-for-you tasting! The atmosphere at The Perfect Blend is very quaint. Lots of windows allows for great people-watching and views of The Weinberg Center, The Frederick County Courthouse and other downtown Frederick sites. There is a wall-mounted TV and a few tables with chairs to choose from. There is also a bar-like table with chairs that runs across the window facing West Patrick Street – perfect for the customer who wants to have some alone time while enjoying one of this cafe’s offerings. There are also several tables and chairs located right out front of the café for the true people-watching aficionados! 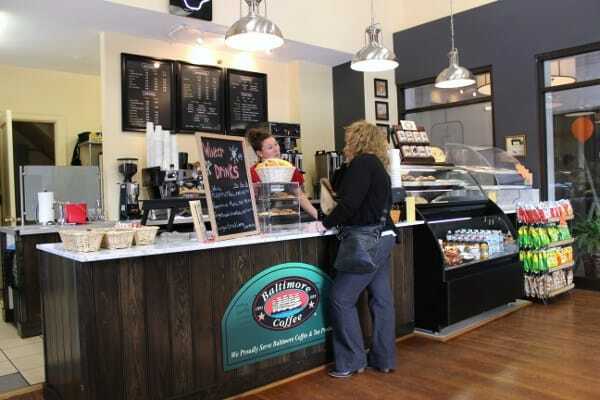 The thing that I loved the most about The Perfect Blend was actually the owner, Rachel Joannides! As soon as Pam and I walked into her café, she greeted us with a big smile and welcomed us into The Perfect Blend. Pam had her camera out, so we explained to Rachel that we would be taking some pictures in order to write a post for our blog, as well as an article for Find It Frederick magazine. Rachel was so gracious and excited to have us review her place. 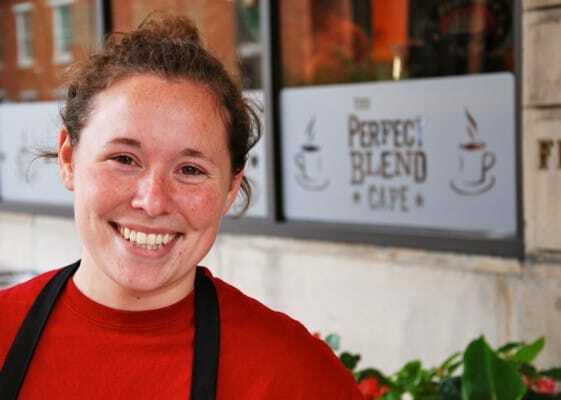 My first thought was that this young woman was an employee of the café, but as we got to know Rachel we discovered that she owns The Perfect Blend, at the age of 21 year’s old (a recent birthday, I might add)! While we sat and ate our lunch, an older gentleman in a power wheelchair came in, and we observed Rachel converse with him as if they were old friends. This young lady is special, and so is The Perfect Blend. 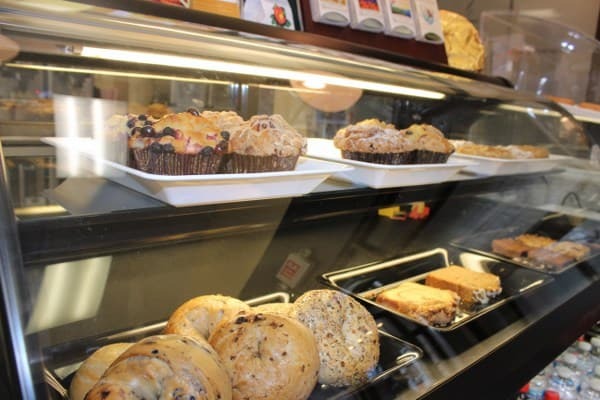 So, if you are out and about in downtown Frederick or if you work in the area and need some nourishment, OR if you are seeing a matinee at the MET or The Weinberg Center for the Arts – check out The Perfect Blend Café! And, tell Rachel the Housewives of Frederick County sent ya! Very well written! The food looks yummy!!! Good luck to Rachel!! Thank you! It really is refreshing to see someone so young working hard and succeeding! I’ll have to check it out the next time I’m in Frederick! That soup and sandwich looks amazing. It nice to see a young person working for themselves and towards their dreams. I wish her nothing but success. OOH! 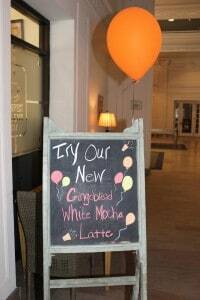 I’ll have to try it out – always up for a good, locally owned coffee shop (especially downtown)!